Preheat the oven to 375 degrees. Use a fork to pierce the skins of the potatoes. Bake the potatoes until soft, about 4o to 45 minutes (depending on size). Heat 1 tablespoon olive oil in a skillet over medium high heat. Add the onion and garlic and cook until soft, about 5 minutes. Add the corn and spinach, cook for 5 minutes more. Season with salt and pepper. Stand up each potato, on its small end, in a baking dish. Cut the top ¼ from each potato. 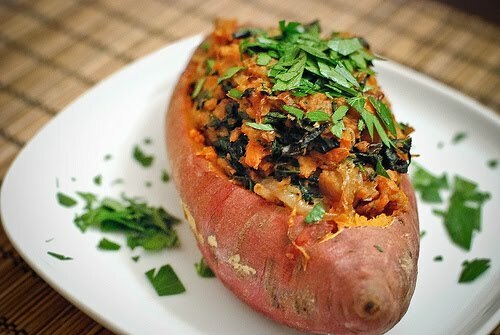 Remove the flesh from the inside, leaving 4 sweet potato shells. Roughly chop the flesh and stir into the spinach mixture. Stuff each potato with ¼ of the spinach/potato mixture. Drizzle with the remaining 1 tablespoon olive oil. Reduce the heat to 350 degrees and bake for 20 minutes.